With the advent of a new series of Twin Peaks, it seems a pertinent time to delve back in time to the original show. If you either missed the original, or need a little refreshing in a series which often held tone and mood to be more important than narrative clarity, then you could do worse than pick up Twin Peaks FAQ (2016. 274 pages), written by David Bushman and Arthur Smith. The show was created by David Lynch and Mark Frost and was built upon the event of Laura Palmer’s murder. In truth this was just the hook to hang a show which would look at the nature of evil and duality, hence the show’s title, Twin Peaks. The series featured a mixture of absurd and surreal people and events and because of this some things were never going to make sense; this was after all a show being pulled in two directions, Lynch with a surrealist eye for form and Frost, trying to maintain some form of structured narrative. This led to instances of sequences which even Lynch has admitted had no other value than they looked good at the time. Although I can easily recommend the book there were two small issues I had with it. 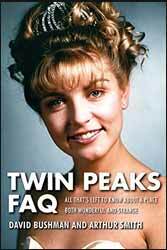 The first is the title, FAQ is the name for a series of books covering a variety of subjects, but in the case of Twin Peaks none of the book is structured as questions. What you do get is a comprehensive background on the show a look at the various characters and a look at the show itself, all in satisfying depth, but no questions, no answers. The other thing was the way the book was written. For the most part the authors style is fairly straightforward and sober as they discuss the various merits and theories which surround the show, but then inexplicably on a small number of occasions the language changes to that more akin to a surfer dude. It's very odd but, in truth, not a great distraction. Overall this is a well-researched and in-depth look at the show; it even had some information which was new to me, so well worth a look from either a current or soon to be fan of the show.